L ike many other people of good will, not only Jesus-followers, I have been appalled at the recent activities of the caliphist group ISIS, particularly their brazen attacks against Christians and other religious minorities, which are an affront to any conception of justice. 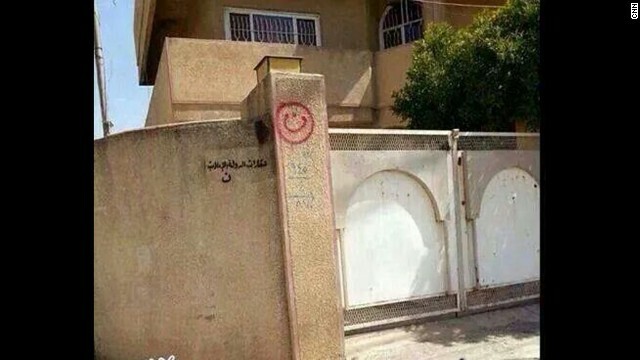 After having their homes marked by the militants with the Arabic letter nun (N), Christians were given an ultimatum to leave, convert, or face execution… this after being a resident faith in Iraq for almost 2000 years. (Up until now, they’ve been referred to as “one of the oldest surviving continuous Christian communities in the world.”) The one bright spot in this story is how this symbol is being taken up, by Christians and others around the world, as a powerful symbol of solidarity. It is my firm conviction that the right of freedom of conscience, the right to choose one’s faith, or not to choose, is a fundamental right of every human being. We should not react to persecution of those who are in some way “like” us, while discounting the persecution against others… that’s not just, that’s self-serving. And I deeply appreciate those nonbelievers of goodwill who are standing for justice on their behalf. But as a believer in Christ, I experience the spiritual unity that comes from every believer being a member of “one body” (Rom. 12:4-5; 1 Cor. 12:12-13; Eph. 4:4; Col. 3:15). In light of this organic unity, we experience the attacks upon any “members” of this body as injurious to all of us. We are properly moved by feelings of horror, disgust, outrage. And, as people of faith, we are moved to pray. But in this neck of the woods, it seems that most often the focus of our prayers is that the attacks stop, that people would just have the ability to live in peace and be free to seek and worship God as they see fit. Now there’s nothing wrong with that… certainly, if we advocate before the authorities of the world for religious freedom, then we should pray for it. However, interestingly enough, the more I listen to the voices from the global Body of Christ, there is a bit of a disconnect. Not in the sense of global unity, not in the passion for the rightness of affirming religious freedom for all people, not in the moral outrage at the brutal and barbarous acts (which affect other faiths and Shiite Muslims as well as Christians). But how we pray. I have had opportunity (most recently at a World Evangelical Alliance global mission convocation in Turkey) to fellowship and interact with people who minister where persecution and fear of harm or death for adherence to faith in Christ is a daily reality. And believe me, they do ask for and appreciate prayer. That hasn’t convinced me to NOT pray that the persecution would stop… I do that all the time, but I also pray as I’ve been requested to by those for whom I am praying. But I do so because I know that the God to whom I pray loves justice. I do so because I feel led, not because those who are suffering have asked for it. Now that makes me wonder about the way we approach certain things here in the place in which I live. I’ve heard it called “persecution” when media stars lose jobs because of something they say. Or when the legislature rules in a way that is out of sync with my particular views. How might it look or sound if those believers who were feeling “persecuted” around these parts reacted as our persecuted brothers and sisters in actual danger of death did? If we prayed FOR our “enemies,” if we prayed more about our own faithfulness, perseverance, asking for the strength to love instead of focusing on our own rights, our own comfort, our desire to see ourselves respected in the public eye, the media, and popular culture? Or – to suggest a truly intriguing thought experiment – what if all the believers “suffering persecution” in Iraq, North Korea, Nigeria were to wake up tomorrow morning and find that they had “traded places” with the believers who are “suffering persecution” in the USA? What would they think, what would their morning prayers sound like? And, of course, the suffering saints in America would wake up in Mosul, Pyongyang, or Kwada… what might their reaction be? And if, after a week in each other’s realities, they could somehow be brought together to compare notes about their experience, what would each group have to say? And how each contingent feel when it was time to “go back home”? Previous Post Yes, slavery is bad. But what CAUSES it?